Great choice in ultimate modern version. I don't have that one personally, but it is a great looking figure which looks like it's being re-released in the upcoming two-packs. 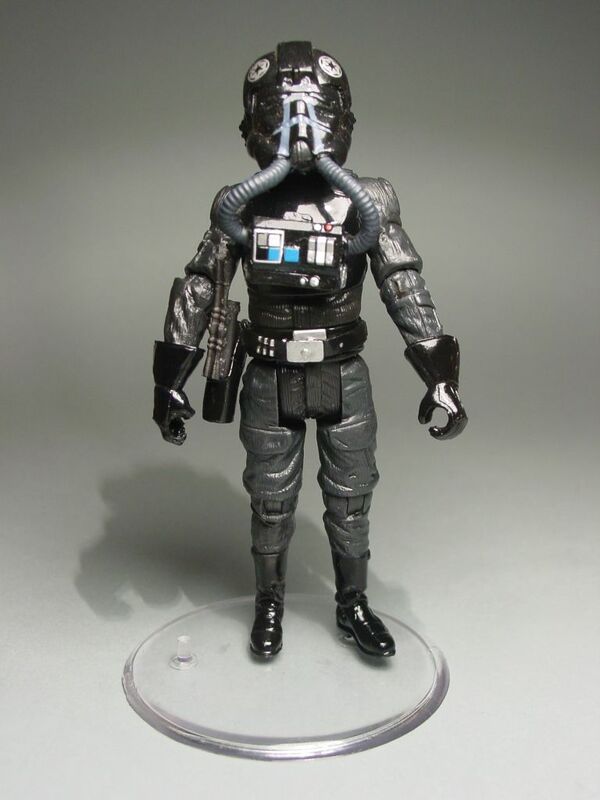 The vintage TIE fighter pilot is another great figure....I used him in Darth Vader's TIE since I did not have the regular TIE. I think I like vintage's pistol better than the evolutions one. I liked him, though he was a neckless wonder. The POTF2 one still looks cool, because the heroic proportions mean his head/helmet isn't accurately huge. I was playing the TIE Fighter PC game around that time, so that figure really appealled to me. Also, in some aspects the Saga 2004 version looks better than the evolutions one. Maybe the total black flight suit vs. the charcoal grey flight suit. I loved, loved, loved the vintage TIE Pilot... It's still one of the coolest vintage figures. His proportions were cool, he was weird compared to other Imperials, and he rocked the all black which made him cool to myself (as a kid) for no other reason than he was more badass looking than the other Imperial troopers. Modern incarnations vary to me... The POTF2 was a decent sculpt for its time, but they were prone to leaning forward and falling. Hasbro updated the legs to have knees, which was kind of cool (though kind of pointless at the time), and those same legs fit perfectly onto the POTJ "Imperial Officer", actually. After that, the Saga figure was cool but his ****** lack of articulation on the arms, coupled with one arm strictly meant to pose on the belt, and a left arm with wrist articulation for absolutely no reason, really limited my appreciation of that figure. 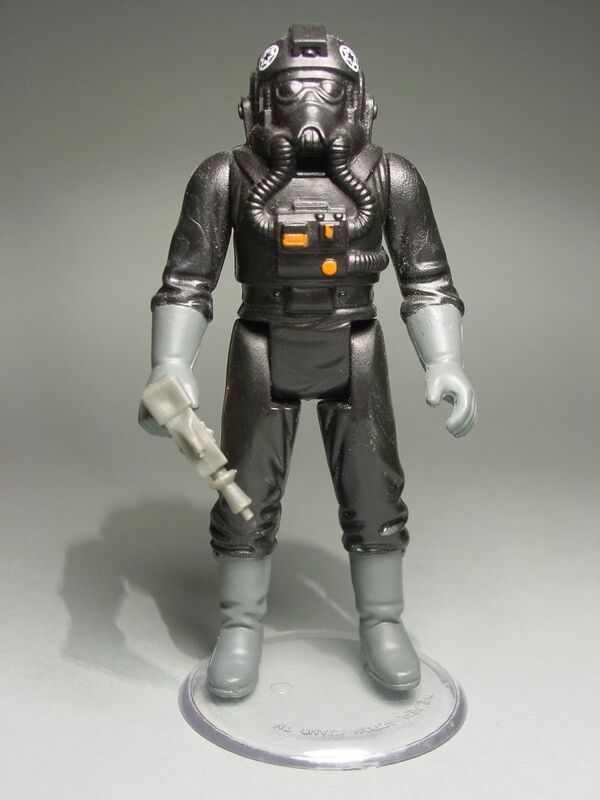 Flash forward to the modern sculpt of the TIE Pilot, which is borderline super articulated (I'd 100% buy a resculpt of this figure, in bulk, if they gave it the SA treatment like the AT-AT Driver... Removable armor and helmet would be ideal as well, ala the Death Star Gunner), and I think they're the ultimate version of the character. I think the bodysuit's a little light, but in ANH the TIE Pilots suits were a hair lighter than their armor which is a pure black. Kind of weird, and I don't think Hasbro's caught the effect perfectly yet, but I think the Evolutions figure looks best. I think the Saga TIE Pilot though, now is kind of like those crummy Arena Jedi from 2002... Having an SA sculpt, makes me appreciate the older figure a bit. THey blend in together well with the Evo figure. I'd like the chance to pick up a few of the Evo figure, perhaps a little darker in color on the suit though... barring a full-on resculpt, of course. I'd totally buy a ton of a SA resculpt on this one. Cool figure though, and one of my favorites from the vintage line. On the pistols, I prefer the new gun... Only because the vintage figure never held his gun well, and shared it with the Bespin Guard, whereas the blaster he's rocking these days is in the films and EU as an Imperial gun. I could've done with him gettin gthe Rebel Fleet Trooper-ish pistol too, or something like Tarkin's POTF2 pistol (which turned up in EU as an Imp blaster too, ironically, even though I think Hasbro made its design up themselves). 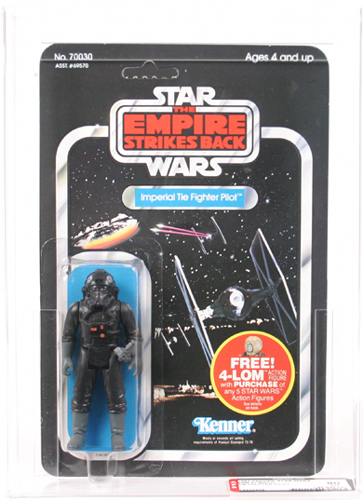 In one of the Action Figure Archives book (I think the one from 98), it says the vintage version is from ANH because the pilots had an extra tube coming out of the breather box that loops from the front to the back. Has anyone ever seen a picture of this variation? Is it noticeable in the movie itself when Vader takes those pilots with him down the corridor when the Rebels first attack? I've looked for the hose but I've never seen anything definitive one way or another. 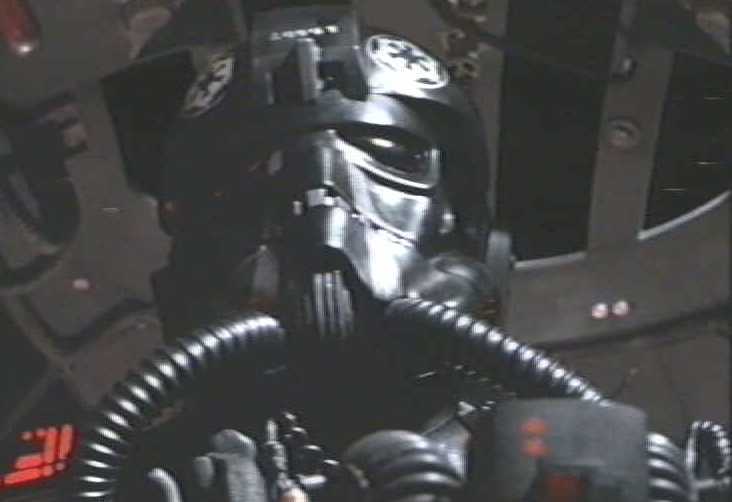 If the ANH TIE Pilot did have that hose then that means that it's a minor vintage gap since none of the modern TIE pilots have had it. The stripes from nose to chin are an accurate detail depicted with the modern version release. Also is nice to see the belt with holster. 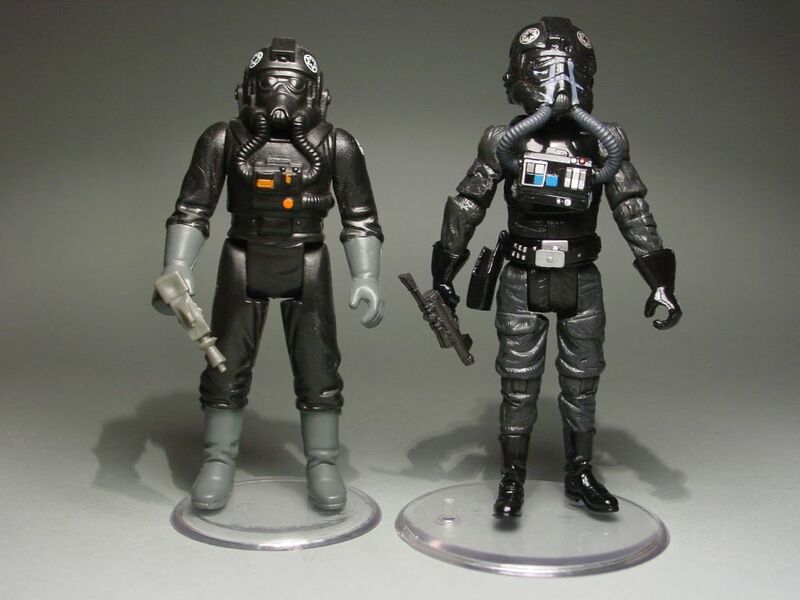 These improvements are also an update of the saga version tie pilot, version that couldn´t grow taller but Hasbro enhaced his details. I really like the Saga "Battle of Yavin" version. Have six of them. 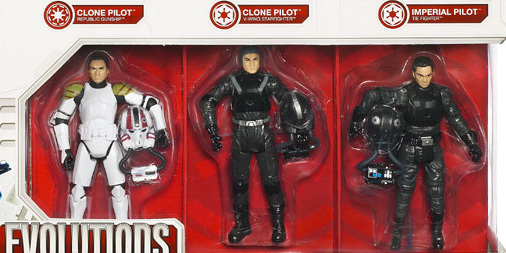 The latest modern figure has a removable helmet, and I'm not a fan of that. Not at all. The thing about those two pilots in ANH is that their helmets sit so low on their shoulders. The Evolutions version's helmet sits too high. The vintage pilot is not really a favourite of mine, but I do like the off coloured gloves and boots. The AT-AT Driver had similar complaints, but I've found that I can push the helmets down on my pilots pretty well and get them to sit lower, more realistic looking than how they seem to naturally want to rest. It takes a little elbow grease to get them to look just right though. As it happened with the legacy at at driver, when Hasbro wanted to improve details of the helmet, it grew bigger. 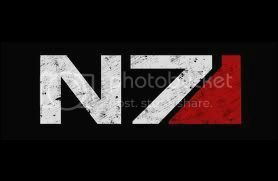 This is the case for modern tie pilot too. A helmet with more detail that needed more accesories like breathing tubes.